Scott Frank, a New York transplant to the Willamette Valley, established Bow and Arrow with his wife Anne in 2010. He describes his project as an homage to the Loire Valley, and works with Loire transplants like gamay, pinot noir, chenin blanc, sauvignon blanc, and melon de bourgogne. Scott’s take on melon is briny and fresh, with just the right amount of richness to support all things Thanksgiving, from oyster stuffing to roast potatoes. Joe Swick is a fifth-generation Oregonian whose family's roots are based in the eastern part of the state and the Columbia Gorge. His passion for wine started while working in the wine department of his local organic specialty food store, and continued to develop when he worked his first harvest at at Owen Roe in 2003. After working over 15 harvests around the world, Swick came to believe that wine should be made simply and authentically, have nothing added or subtracted, and most importantly, express place and vintage. As a result, when he started making his own wine in 2012, Swick sourced all of his grapes from organic, biodynamic or sustainably farmed vineyards and insisted on minimal intervention. "Wyd? U Up" is fermented for one month using all natural yeast and aged for an additional 8 months in neutral barrel. Its bright acidity and crisp notes of green apple and yellow pear make it the perfect wine to cut through a rich gravy and hearty stuffing at Thanksgiving. Sourcing grapes from all farmer-owned vineyards in Willamette Valley and Applegate Valley, winemaker Brianne Day's "Vin de Days" blend of 38% pinot blanc, 20% müller thurgau, 19% riesling, 18% pinot gris and 5% muscat is juicy, aromatic and slightly off-dry. After college, Day worked abroad for several years before returning to her native Oregon to expand her knowledge of the wine business. She spent time in retail, sold barrels for a cooperage, and furthered her winemaking passions working with Willamette-based producers like Grochau Cellars and Belle Pente. The resulting wine is zesty, balanced and full of delicate floral tones backed by fresh peach and stone fruits with a small dollop of lemon cream. 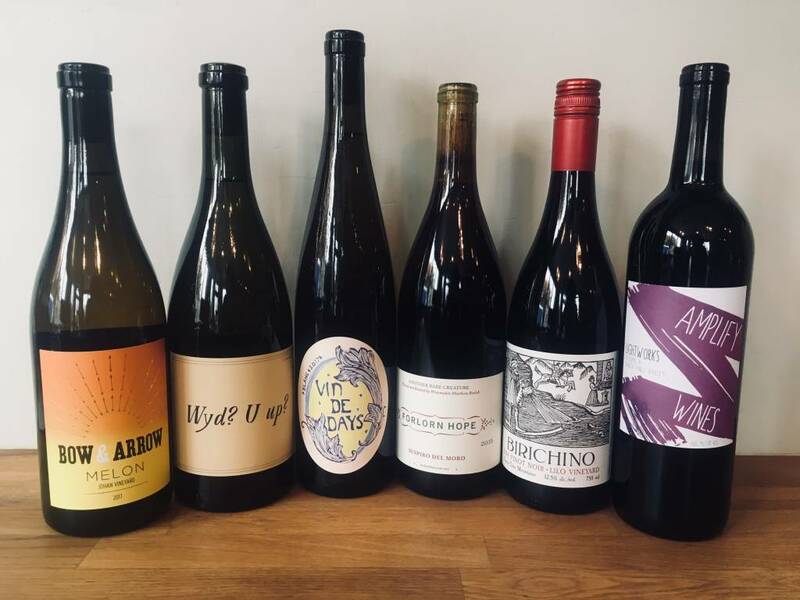 Matthew Rorick uses his project, Forlorn Hope, to seek out and highlight “rare creatures” across northern California, sourcing grapes that he says would otherwise be considered “misfits - that pay tribute to California's eclectic and often unexpected viticultural heritage”. Suspiro del Moro, which translates to “sigh of the Moor” is made of 100% alvarelhao, a red grape native to northwest Iberia. Matthew sources this from vinegrower Ron Silva in Alta Mesa, who specializes in Portuguese varietals. Aromatic and fresh, with bright, flowery notes and balanced acidity, we think this exotic red is a perfect compliment to a traditional Thanksgiving menu. Amplify is the winemaking project of Santa Barbara natives and music lovers Cameron and Marlen Porter. Their main goal as winemakers is to highlight (amplify) the individual character of each vineyard site. This bottling is 100% merlot from of a blend of several back vintages, an effort to explore a place removed from time, it is meant to be an “endless loop of its site”. Their description is perfect - “ voluptuous, curvaceous, but with sharp elbows”, this is merlot with plenty of body, and just the right amount of grip, an excellent compliment to hearty spread. On a south-facing slope perched at 300m elevation in the Santa Cruz Mountains, the Lilo Vineyard opens to an unobstructed view of the Monterey Bay. This steep slope is comprised of a mix of schist, shale and sandstone, producing a light, mineral-driven pinot noir reminiscent of Volnay. Fermented with native yeasts, aged in neutral French barrels and bottled unfiltered, we find aromas of red cherry, hickory smoke and pomegranate that lead to balanced red fruit and baking spice. Pair this beauty with a rich cranberry sauce or some of that in-demand dark meat from a roasted turkey leg.